After a tiring day at work, I hurried with my dinner - at 5pm! I hired an ola cab a little past 1715hrs, and rushed to Basaveshwara Bus Station - the satellite bus station located off Tumkur road, near Jalahalli. I got there by 1740hrs. The bus station now homes all the departure of Kerala RTC via Salem (except one bus) and is now a beehive of activity. I headed to the platform a little past 1800hrs - a while after my bus was taken to the platform. My bus was scheduled to depart from Peenya at 1815hrs, and later from the Satellite bus station at Mysore road at 2000hrs. The bus is scheduled to operate via Mathikere - and hence the longer running time. However, on the day of my trip, we did not have any passengers from Mathikere, and the crew decided to start from Peenya a little later than scheduled. The crew decided to let a later bus go ahead of his - since they had to leave earlier from Mysore Road, and there is limited platform availability. We finally departed from Basaveshwara bus station, Peenya at 1836hrs - 21 minutes past scheduled departure. The driver was fast from the word go, and he quickly joined Tumkur road. We headed straight to Goreguntepalya and turned off to the outer ring road towards Mysore Road. We were a bit fortunate with the traffic - all traffic piled up behind us. The bus that was following us got stuck at all the junctions and took much longer than we took. We got to Mysore road Satellite bus station by 1921hrs - 39 minutes to go for our scheduled departure time. The bus was parked at the departure bay - I headed to meet my acquaintances at the bus station. All set to depart from Platform 7!! We had about 17 bookings, and managed to get a couple of walk-in passengers as we departed from satellite bus station, at 2008hrs - eight minutes behind schedule. Traffic was building up on the main road already, but we somehow managed to dodge most traffic, and managed to get to Shantinagar by 2038hrs - a few more booked passengers joined here, and we got off by 2040hrs. I was really tired, and badly wanted to sleep. Luckily, they did not play any movie/music - setting the perfect environment to sleep. I kept dozing off time and again. We stopped near Christ College for pickup at 2052hrs. Traffic slowed us after Christ, and we got to St John's by 2108hrs. Majority of the crowd joined the bus here, and we got moving by 2112hrs. I remained awake till we got on to the elevated highway. I vaguely remember passing the electronic city toll gate - and then slipped into very deep sleep. I had a nice uninterrupted sleep till the crew actually switched on the lights and switched off the airconditioner - the bus had halted for dinner break then (2252hrs). It took me a couple of minutes to get to sense - I was quite hungry as well. I headed out to the restaurant (Saravana Bhavan Classic, Kurubarapalli) for some quick food. We started from there at 2317hrs - I was awake till we passed Krishnagiri toll gate. I slept soon after that - perhaps the best sleep I've had in a bus, in recent times. I woke up only around 0530 - as the bus shook violently, as it cleared large potholes on the under construction highway! We were close to Thrissur already! I did not identify the place till I saw a church located in the city. I got off the bus at 0555hrs, at Sakthan Nagar bus station, a little before the KSRTC bus station. 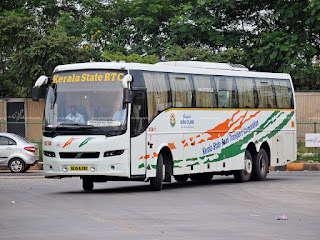 Closing Notes: The bus, RS784, KL-15-A-282, homed at Ernakulam depot had clocked a little over 5.91 Lakh kms - she has had a couple of accidents in the little more than 3 years she's been with KSRTC. 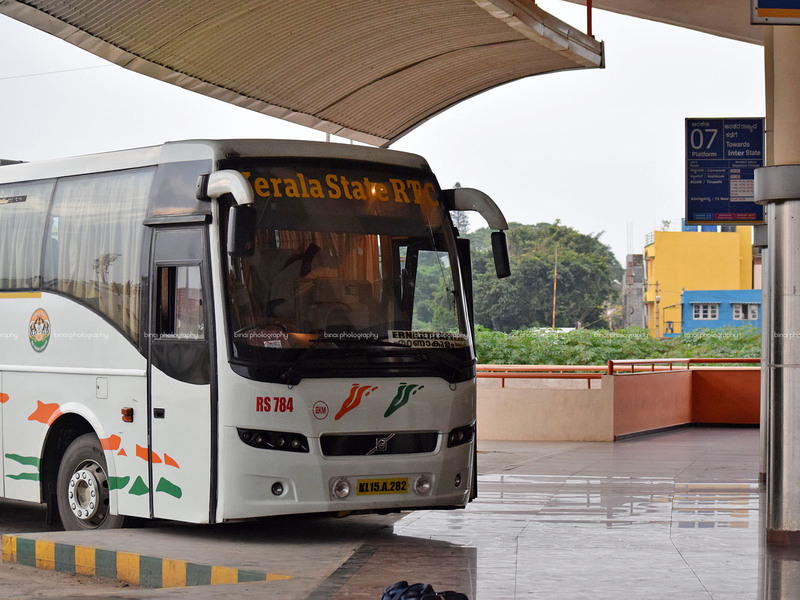 Ernakulam depot has been an underperformer when it comes to operating services or maintaining their buses. This service has been an exception - they've maintained the buses operating the Bangalore service really well, and their crew has been exceptional every single time I traveled with them. 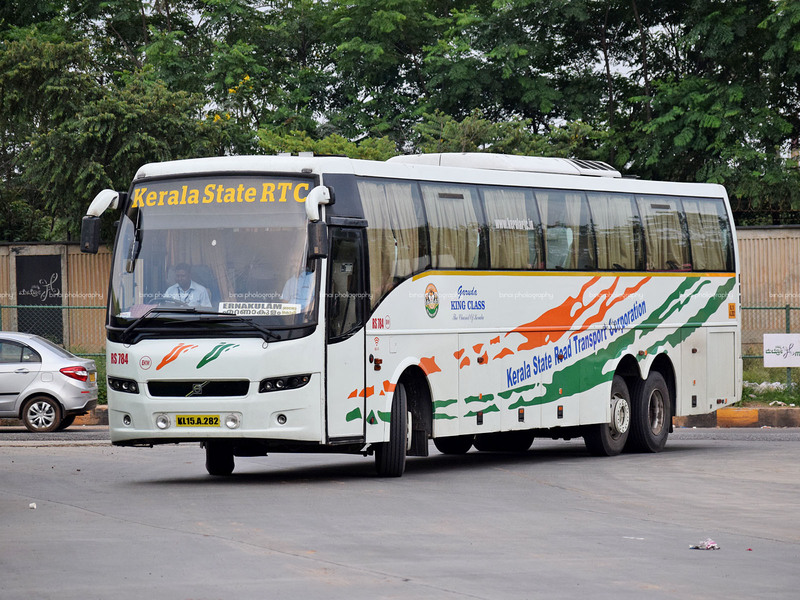 The crew have a sense of belonging, and work in great co-ordination - quite opposite to what one sees in the other premium services of KSRTC. They were not the best - water bottle and blankets were not distributed to passengers, but they were soft spoken and efficient at what they did. Although the end-to-end running time of 11h19m is very high - the running time from Madiwala to Thrissur was only 8h43m, including a 25 minute dinner break, was comparable to other operators. Although I did not realise, my google map tracked one 10 minute 'break' and entry to palakkad bus station en route. So overall great timing, and a very good service. Will I take this service again? Absolutely - convenience wins over everything else. Do they really have to depart at 1815 from Peenya in order to ensure an on-time departure from Mysore Road Satellite Bus Station at 2000hrs? They have to, if they have pick up at Mathikere.